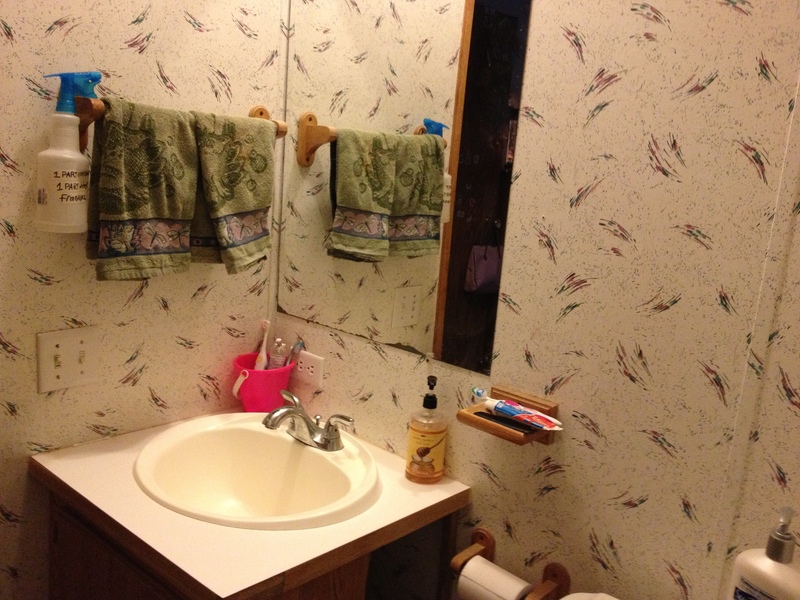 Okay – I understand that bathrooms are not the most exciting place in the home but I wanted to share anyway. 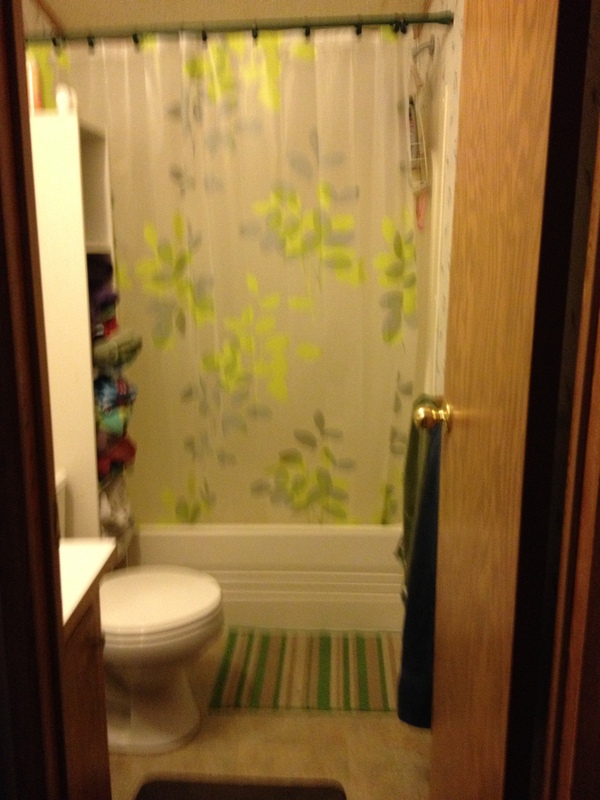 There are three full bathrooms in the new house that get regular use. The first floor bathroom gets heavy traffic with all of our respite guests, the kids all share the second floor bathroom and we have our own bathroom off our suite. 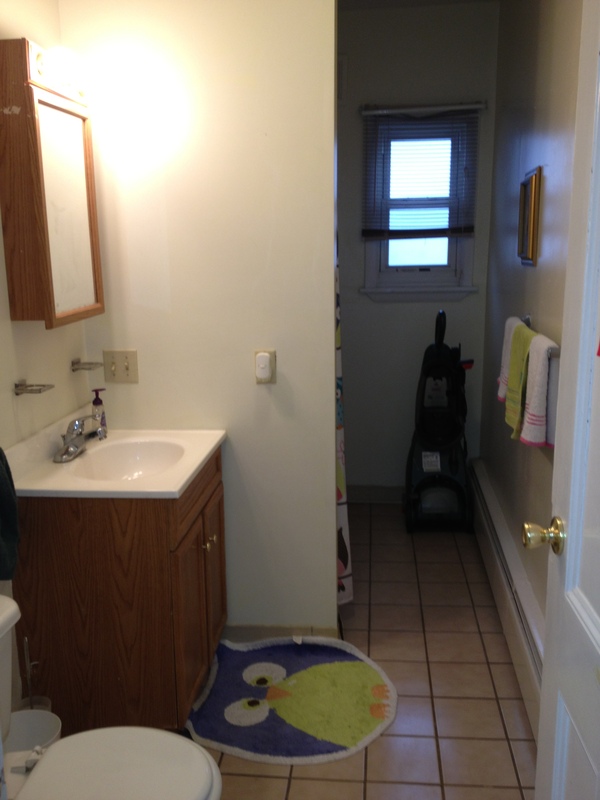 This is our first floor bathroom. Not minimalist but not cluttered either. I have found time and time again that it’s easier to clean when you have less stuff. This is especially important in the bathroom. 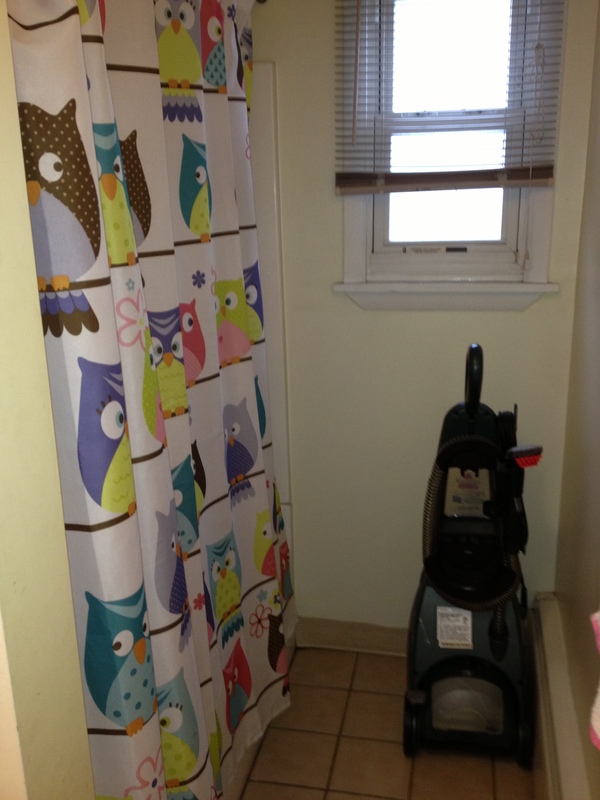 I’ve never known my husband to clean a bathroom and I hate to clean so here is how I make it work. 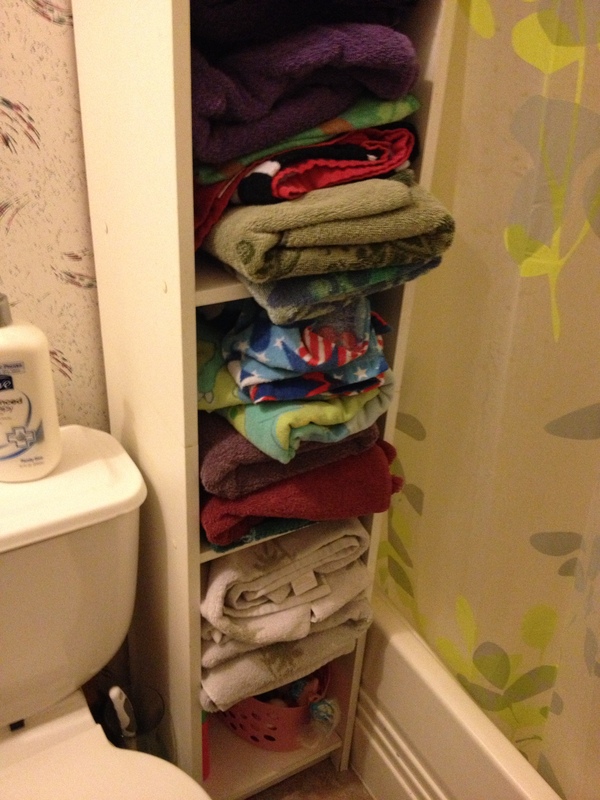 I keep a stack of washclothes on the back of the toilet and encourage their use. When a kid uses the washcloth they drop it on the floor by the door. I swoop them up when I do our laundry. 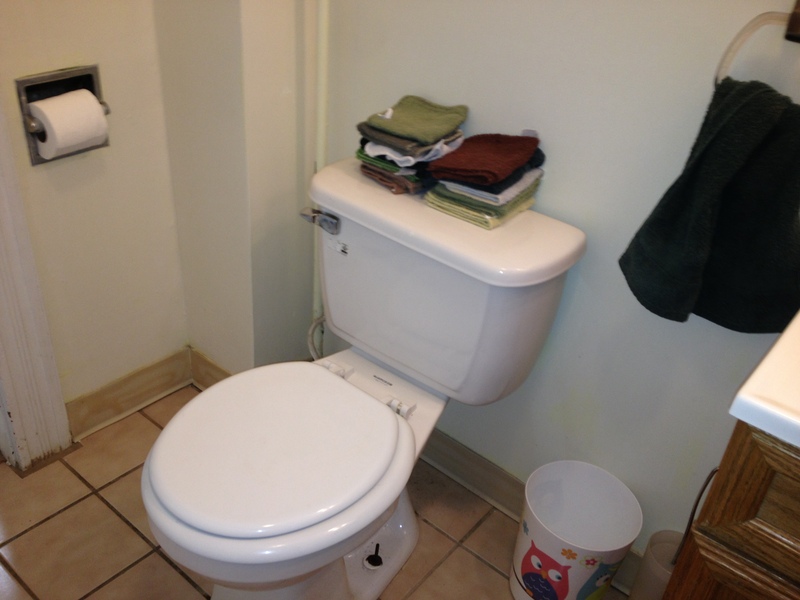 I also use the washclothes when there are any signs of dirt – toilet seats, sink, mirrors, baseboards, light switch. 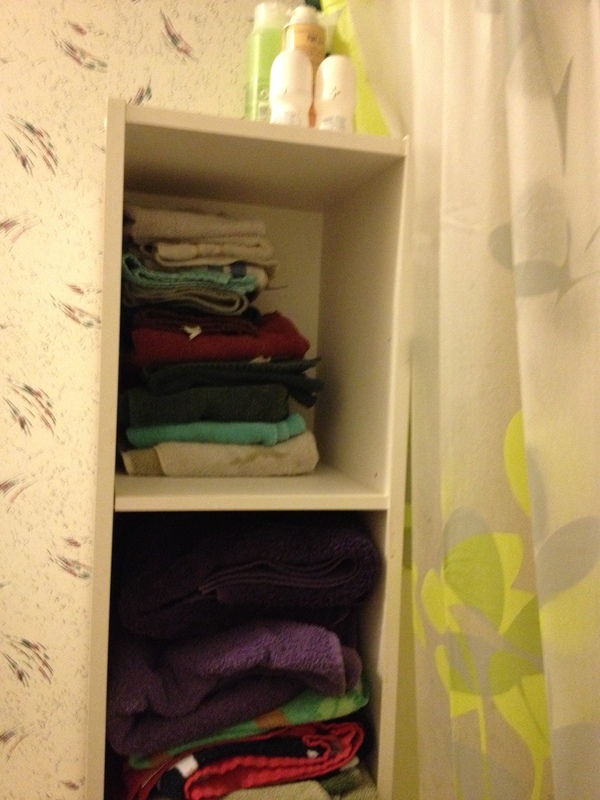 The washcloth gets dropped onto the pile on the floor and then gets washed in hot water. Occasionally some hand soap is added for the messier tasks. First signs of dirt or mess are easier to clean then set in dirt. A quick swipe and we are good – there’s rarely need for a lengthy scrubbing session. 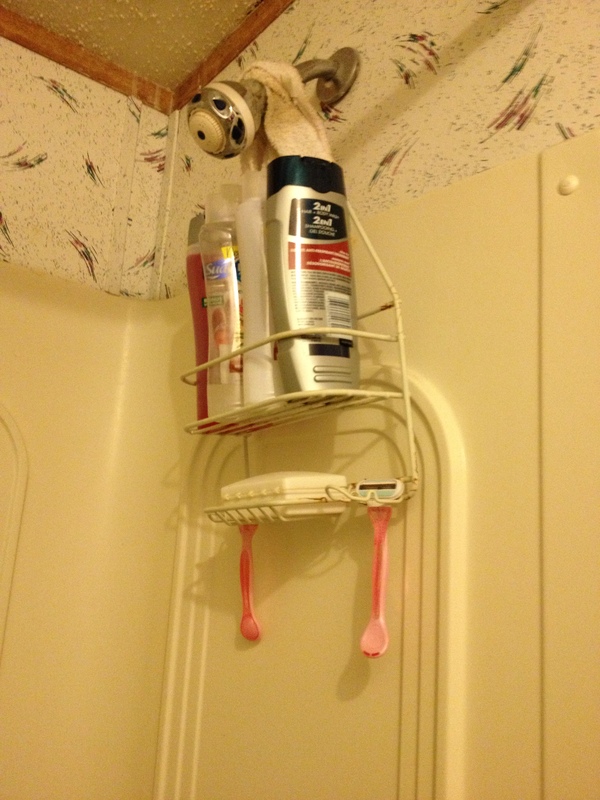 I spray down the shower after use with an all purpose cleaner and clean the toilet (several times a week) by squirting in lysol toilet bowl cleaner and let it hang out in there while the kids are at school. Not too much frills or extras but a definate owl theme. carpet cleaner because you know everyone keeps this in their bathroom. 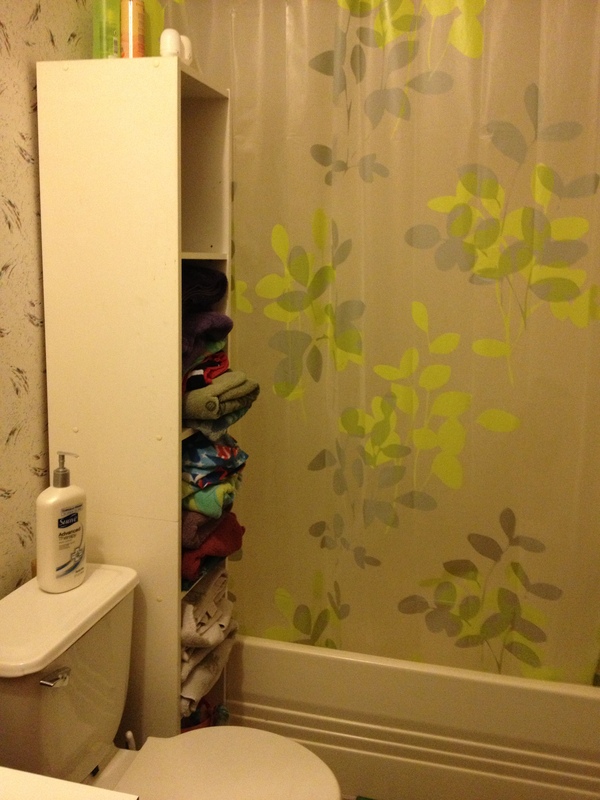 Under the sink with 2 burgandy bath towels, 1 blue bath towel, toilet paper, shampoo, conditioner, baby shampoo, toddler toilet seat. I do not keep cleaners in the bathroom due to the ages of children we get. I would hate for a child to get under the sink and get hurt from cleaners. My husband sweeps and mops so I do not worry about doing this. 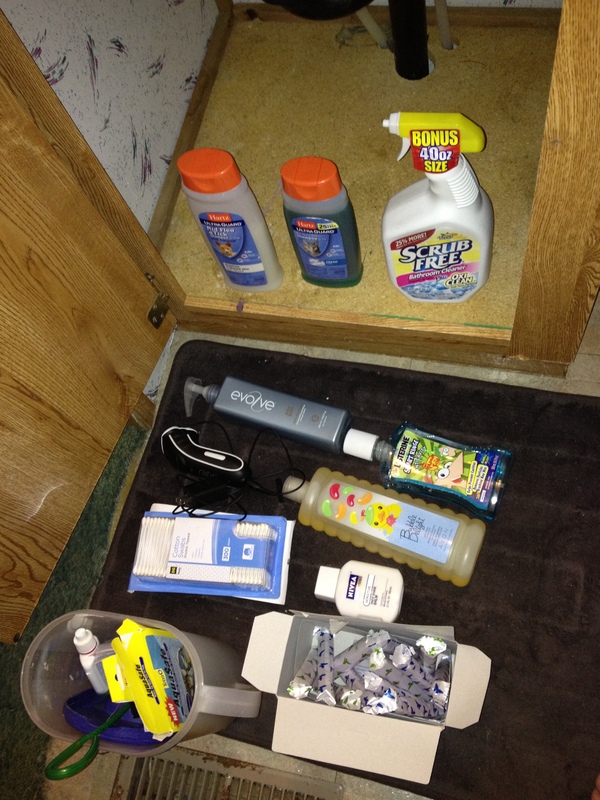 I have made the switch to more natural cleaning products. 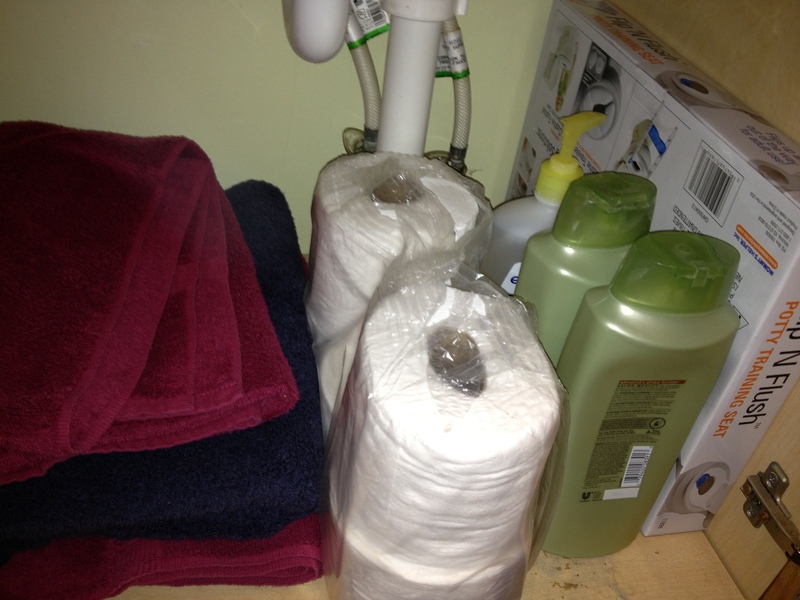 This is a huge step as my favorite section in the store is the cleaning supplies. I could spent an hour in that section alone carefully reading each label to find what product would vanquish dirt and grime from my home and magically make it clean dream. What I’ve learned is that there is no product that will magically make your home clean (unfortunately) and most cleaning supplies really bother either my respiratory system or my super sensitive skin. I’ve started making my own all-purpose cleaner. I use it to clean, disinfect and deodorize my home. I’ve found it to work particularly well in the bathroom. For whatever reason I’m still hesitant to use it in my kitchen. It works incredibly well on soap scum, especially those bath crayons. They are incredibly hard to remove from the walls if you don’t wipe off immediately. 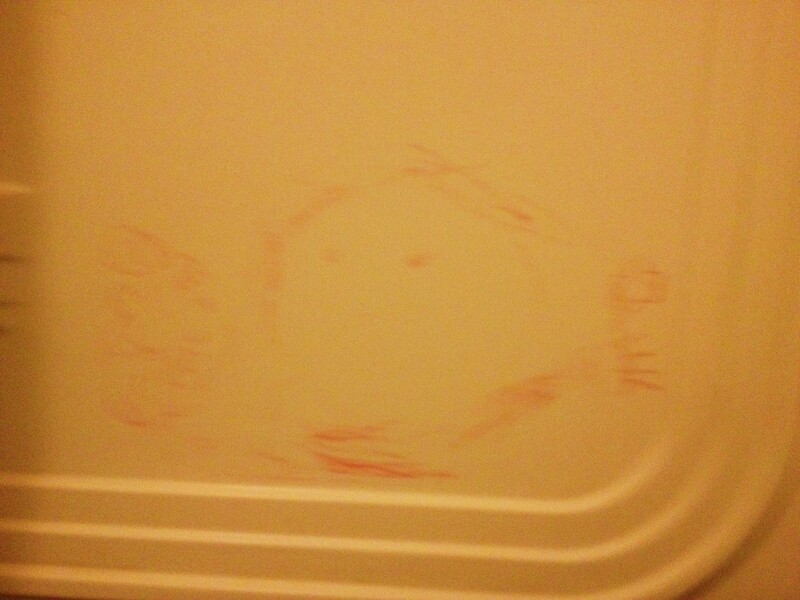 The vinegar solution removed the drawings where the harsher chemicals did not. It’s important to stick to a 1:1 ratio so in other words 1 cup of water to every 1 cup of vinegar. 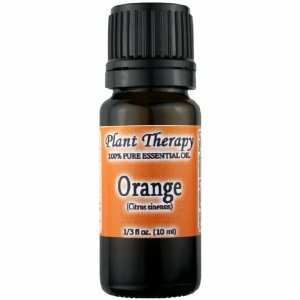 Now I really hate the smell of vinegar so I bought Orange Essential Oil through amazon.com and I add a few drops to the spray bottle with the vinegar water solution and this really helps get rid of most of the unpleasant smell. I’ve also stopped using the harsh chemical scrubs. In its place I have a container full of baking soda. This is particularly useful in the kitchen. Our counter tops stain extremely easy so what I do is dump a small pile of baking soda on the stain and then add water slowly until I have a paste. I then use my scrubber until the stain is removed. You can even let the paste sit for a while on the stain and it’ll come up easier. When our dryer was broken we added a cup of vinegar to every wash load to help soften up the clothes. One of my favorite cleaning combinations has to be vinegar with baking soda (baking soda volcano anyone?) This is particularly useful for the toilet. You dump about 1/4 cup of baking soda into the toilet bowl and then add 1 cup of vinegar. you let it sit for at least 15 minutes then scrub and flush. very easy. This combination also works incredibly well as a drain cleaner. I use the vinegar, water, essential oil combination to clean glass and mirrors. 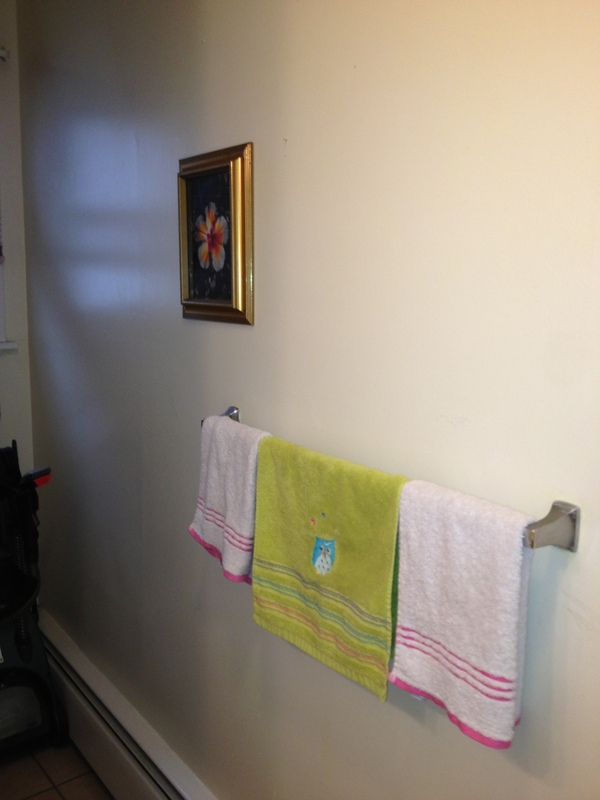 The first time I cleaned the bathroom using nothing but the vinegar, baking soda, water and essential oil my husband commented that the bathroom never looked cleaner to him. 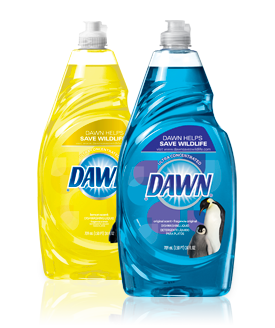 For the kitchen I have started cleaning with baking soda and have switched to Dawn dish soap as a gentle all-purpose cleaner. 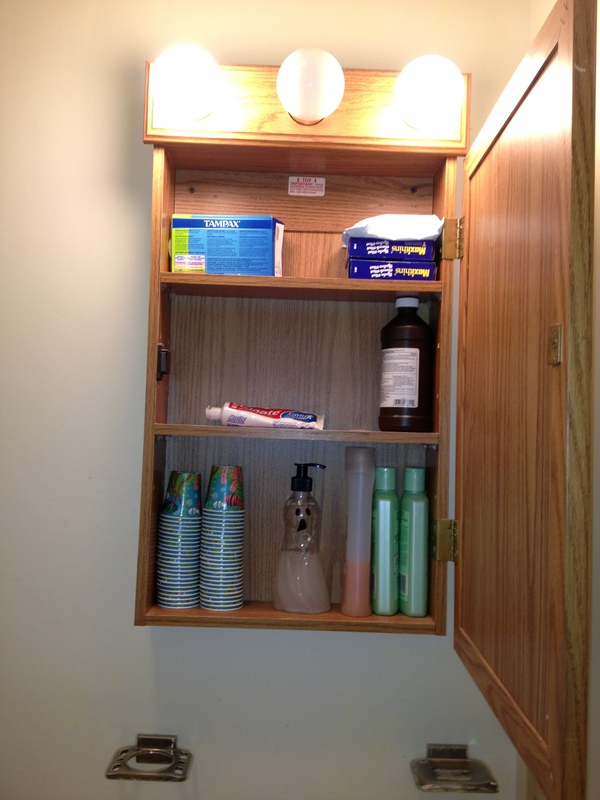 I also keep a bottle of hydrogen peroxide handy but don’t use it often because it can stain. While writing this I googled green cleaning and found this wonderful website – Apartment Therapy – 25 DIY Green Cleaning Recipes for the Whole House! The only note of concern is their use of Borax. I used Borax in my homemade laundry soap but this product isn’t necessarily safe to use frequently. (classified as a poison – known to cause respiratory and acute eye problems. also may be concern about reproductive problems) so use with caution and use gloves when using. Here is 20 Mule Team’s MSDS. For carpet cleaning I’ve also skipped using the carpet shampoos and just add vinegar to extremely hot water to the machine instead. It works great. Before I use the carpet cleaner I sprinkle baking soda over the entire carpet and let it sit for about 30 minutes. I then vacuum the carpet in several directions. This makes the carpet cleaner work better as it’s not getting clogged on dirt that could have been avoided. I love Fly Lady products. I bought the purple rags and these work great. They clean easy enough too as I just throw them into the laundry. I’ve accidently dried these with fabric softener like a million times (on the flylady website it says detergent only). I use them until they are dirty and then rewash them. It hasn’t made a noticeable difference to me. They are nice though because they are large, have two textures and are purple. I use them for about everything. I have cheaper rags as well that I bought at walmart. The other set has a mesh scrubby side. I also have the Rubba Scrubba. – I’ve used this on my blinds, the furniture, for dishes and more. On my wish list are the Rubba Swisha for the bathroom and the dish brushes. gotta admit I’m glad that I own this as it helps but it feels awkward in my hand. I’ve also really gunked this up and then struggled to clean it (think long hair or grease – yuck). It always comes clean though and I haven’t been able to break off any of the nubbies yet so it’s a quality product. The Rubba Sweepa is my favorite Fly Lady product. I LOVE THIS! The handle feels flimsy but again – I have not broken it yet. I manage to break everything. This helped me tons when my daughter was going through her phase where she was hitting herself in the head because she couldn’t get the sound of the vacuum out. I quickly bought this and it has helped. She no longer has the vacuum problem but with my husband sleeping nights it helps me when my carpets need a quick clean up. It also helps me clean up my bunny’s hay mess. It was a life saver (and vacuum saver) when we had two dogs. I would use this before I vacuumed and my vacuum stopped clogging up. We bought the Fly Lady mop. and extra mop refills. I like the mop but love the clothes. I will sometimes use the clothes without the mop because they are super soft, big and work. I like the dry mop part as it really collects the dirt and dust. I’ve even recommended this to others. my husband helped me pick this item out from the fly lady store but he continues to use the swifter with disposable wet clothes. He says certain things are too dirty for reusable clothes. My OCD agrees but my logical self shakes my head with this statement. Sounds Great so Now What? Now the problem is – I can’t bring myself to get rid of the harsher cleaners that are under my kitchen sink and in the laundry room. I also can’t seem to part with all my air fresheners. I cling onto them because 1. I spent good money on them, 2. I might need them someday, and 3. it feels wasteful to get rid of them. I put a few out in our yard sale but there is quite a bit more that are stashed in my cabinets.